Tonight is what we call Harvest Moon. It's part of a long history of Chinese Culture. We celebrate this Moon Festival every year. The legend has it that tyrant Emperor wanted to live forever so that he can rule China forever. However, the Empress knows that he is not a good Emperor, and his people will just suffer for generations to come. So, the Empress stole the Emperor's longevity potion and drank it herself. While being chased and hunted by the Emperor's soldiers, the Empress ascended to the Moon for safety. That's why every year around this time, we eat Moon Cake and look at the moon wondering if the Empress still lives on the Moon. During 1969, the landing on the surface of the Moon by Neil Armstrong reported that no one was on the moon other than him and Buzz Aldrin. Even though I was very young, I remember I was very disappointed that he didn't see the Empress. 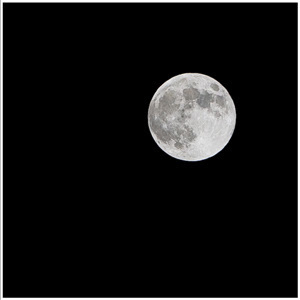 As for photographing the moon, you will need a tripod, the longest lens you have in your possession, and a spot meter. I used my trusty Gitzo Carbon Fiber tripod, and my Canon 70-200mm f2.8 L lens. I spot metered and bracketed my exposures. Sure enough, the slightly under-exposed photo produced the most detail of the moon. Many photography hobbiest, do not know to underexpose the image to gain details of the moon. Many of their photos is a black sky with a round white dot with no details. So, for next year, if you want to try photographing the moon, tryout some of my suggestions above.